Evening folks…while in Canada last week I was also able to photograph a critter I have been trying to locate here in Massachusetts to photograph, a Black Grey Squirrel. 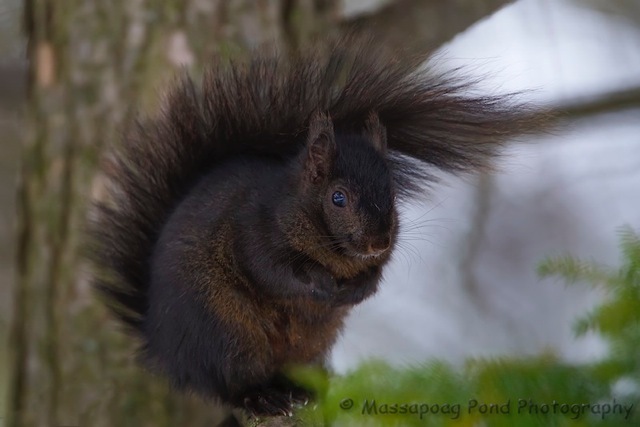 The black squirrel is a melanistic subgroup of the Eastern Grey Squirrel. They are common in the Midwestern United States, Ontario, Quebec, and parts of the Northeastern United States, with a few here in Massachusetts. We stumbled onto a group while photographing the Boreal Owl.